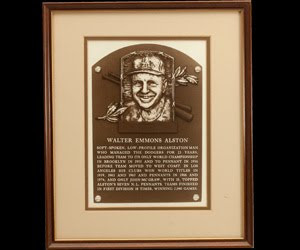 A single at-bat, which resulted in a strikeout, comprised the playing career of the late Walter Alston. But four World Series titles, seven National League pennants, and 2,040 regular-season triumphs later – all realized in a managerial capacity at the helm of the Brooklyn and Los Angeles Dodgers – cobbled his path to Cooperstown. A native Ohioan, Alston earned the nickname “Smokey” in high school because of his blazing fastball. He attended Miami of Ohio University where he lettered in baseball and basketball before signing with the St. Louis Cardinals in 1935. In 1940, when it became apparent he wasn't in the Cardinals’ future plans as a player, Alston was given the opportunity to play and manage in their farm system. He was released by St. Louis in 1944, but was spotted by the keen eye of former Cardinals General Manager and then-Brooklyn President Branch Rickey who signed him to play and manage in the Dodgers minor league system. Following the ‘53 season, Brooklyn Skipper Charlie Dressen insisted on a multi-year contract to continue as Dodgers’ skipper. Brooklyn Owner Walter O'Malley balked at the demand and to everyone's surprise chose the little known Alston to pilot the club. 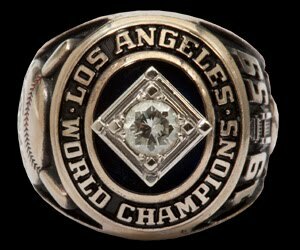 He led the Dodgers to a second place finish in 1954, then won Brooklyn's first World Series title in 1955, defeating the Yankees in seven games. Always displaying a calm, professional demeanor, the unflappable homespun Ohio farmer managed the Brooklyn/Los Angeles Dodgers for the next 23 seasons. His teams won 90 or more games in 10 different seasons. On July 17, 1976, Alston became only the sixth manager in MLB history to win 2,000 games. Just before the end of that season he retired as Dodgers’ skipper with 2,040 wins. He was named N.L. Manager of the Year six times, and led N.L. All-Star teams to seven victories. He was elected into the Baseball Hall of Fame in 1983. The Alston sale of nearly 100 lots will happen in early August. In the meantime, SCP was kind enough to forward along a bunch of preview pics. At the very top is his Hall of Fame Induction ring. 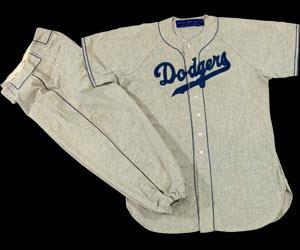 Below is Alton's game-worn road Brooklyn Dodgers jersey from his rookie season as manager, 1954. 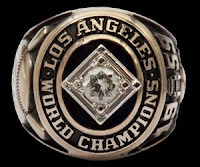 Alston skippered four Dodger clubs to World Series championships. All four of his championship rings will be available at SCP. 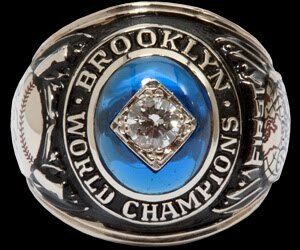 The below photo on the left is his 1955 Brooklyn Dodgers World Series ring, and on its right is his 1959 Los Angeles Dodgers World Series ring. This next item is really great. 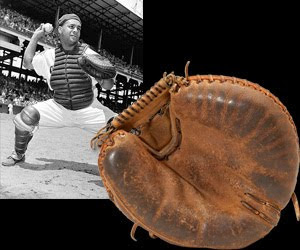 Featured below is Roy Campanella's game-worn catcher's mitt. According to SCP it was given to the daughter of Walter Alston. Lastly, below is Alston's 1983 Baseball Hall of Fame Induction plaque. 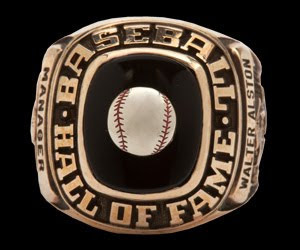 This was given to Alston by the Hall of Fame during his induction ceremony in Cooperstown.